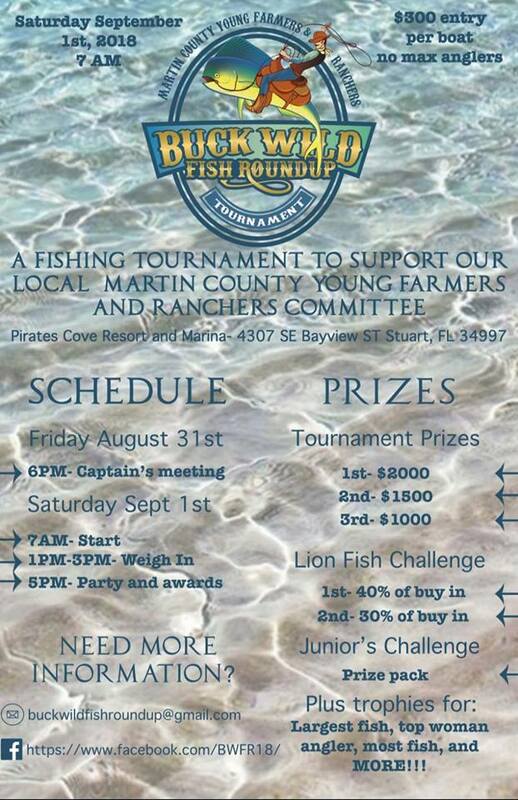 The Martin County Young Farmers and Ranchers’ Buck Wild Fish Roundup will be held Friday August 31st and Saturday September 1st of Labor Day Weekend. Proceeds from this event will fund future educational events and conferences for our committee. Events like farm tours, the 2018 Florida Farm Bureau Young Farmers and Ranchers Leadership Conference, and other like events help educate our committee members on the many different agricultural operations in our state and legislative issues facing our farmers and ranchers. We will also be donating 10% of the proceeds from this tournament to the Martin County Farm Bureau Youth Enhancement Fund to further support youth agriculture programs, like 4-H and FFA, in Martin County. Captains Meeting August 31 at 6pm. Tournament starts September 1st at 7am. Awards Party starts September 1st at 5pm.